The first group wants a simple and inexpensive lightweight stroller that’s easy to move, fold and store. The second group is also looking for the conveniences that accompany a lightweight baby stroller – but doesn’t want to sacrifice “luxuries” like large sun canopies, reclining seats and leg rests, or ample storage space and cup holders. There are plenty of umbrella strollers to satisfy each group; as you’d guess, however, the ones with the bells and whistles are usually the ones with the bigger price tags. In either case, an umbrella unit is ideal for shopping (when you have to repeatedly take the stroller in and out of the car), downtown walks (where the added maneuverability of a lightweight stroller is a real plus), or traveling. That’s why those who depend on a heavy-duty or jogging stroller for day-to-day walks or runs around the neighborhood swear by the convenience of having an umbrella stroller in the closet or car, and it’s why those who live in crowded cities or in buildings with lots of stairs couldn’t live without one. Umbrella strollers are also a good way for parents who live in favorable climates to get away without having to spend their entire budget on a heavy-duty model. Umbrellas with more advanced features will still cost quite a bit but will be less expensive than comparable full-sized or jogger models, leaving some extra money for playpens, outfits – or at least an ice-cream while out walking the baby. In our look at the top 5 best umbrella strollers we’ve included both bare-bones and “luxury” models to provide the widest-possible range of choices, while taking care to differentiate between them. We begin with one of the high-end umbrella strollers which most parents would be likely to find suitable for everyday use. The G-Luxe is a bit larger than you might picture when you think about an umbrella, but it’s still relatively lightweight (14 pounds) and folds easily, even though you’ll need two hands to do it. It’s also cool that it will stand straight-up (with the help of a kickstand) after it’s folded. You may feel like you’re pushing a full-sized stroller when you take this UPPAbaby for a spin because it maneuvers and rolls in much the same way, thanks to its four shock absorbers (which you won’t often find on an umbrella model). That means you won’t encounter many problems on pavement or flat dirt, but probably won’t want to take it onto the lawn or gravel. It’s only so-so going up and down from curbs, primarily because the brake locks sometimes become accidentally engaged. When you’re intending to engage the brakes, though, they’re easy to work. This is a solid stroller built to last and for baby’s comfort. True, it’s made from lightweight aluminum in order to save weight, but it feels well-constructed. The washable fabric is both soft and comfortable while being sturdy and durable, and there’s plenty of extra padding from the removable and washable seat pad, to the leg rests. It’s comfortable for mom as well, with thick foam padding on the handles as well as a decent-sized storage area underneath the seat and a cup holder. The seat back is easily adjustable (only requiring one hand) with three positions, and the footrests are adjustable as well. The pull-out canopy is a strong point for the G-Luxe, creating a large sun shade for baby that’s rated at SPF50; the only thing that’s missing is a peek-a-boo window. There’s an optional reflective sun visor and an optional rain shield which can each be added. The G-Luxe comes in a number of two-toned colors and looks striking; you’ll find its performance to be pretty striking as well, although you’ll pay north of $250 for the privilege. If you don’t need all of the extras and would like a similar umbrella stroller for less money, the UPPAbaby G-Lite is four pounds lighter and costs almost $100 less and is worth a look, although its features and on-road performance don’t match the G-Luxe’s. This odd-looking umbrella stroller with the odd-sounding name is not the buggy you want if you plan to beat it into the ground. However, if you want a truly lightweight stroller which can maneuver with the best of them and then fold into a size that can fit right into the carryon luggage bin on a plane, the Quinny Yezz is what you need. Let’s start with the reason that this umbrella model is such a joy to wheel around the sidewalk or the park: its wheels. The Quinny Yezz is built on the same type of wheels used for in-line skates, making them uniquely perfect for tight turns and quick changes from pavement to dirt or grass, and the brakes work just as well as they would on traditional wheels. The chassis is set up in a V-shape so the two front wheels are close together and the back wheels are spread apart; that helps with the stability of this stroller and makes it extremely easy to push. What also helps is the high-quality, proprietary plastic composite used to build the light but very strong frame. It also “self-stands” like the G-Luxe. The fabric used on the stroller is just as impressive; it’s water-repellent, hand-washable ripstop that’s attached to the frame with polyester rope: tight, sturdy and beautiful – and comfortable for baby. There are some “missing features” which might add to a child’s comfort, though, including a reclining seat and adjustable footrests. However, it’s not uncommon for those to be missing on an umbrella stroller. What we did think was odd was the fact that the permanently-attached canopy was so small; we know the design of the Quinny Yezz is bare-bones, but it seems that adding a little extra fabric wouldn’t have been difficult. The person who will love this umbrella stroller the most may be mom. The ergonomically-designed single curved handle is comfortable and almost fun to grasp and push, the stroller can be folded with one hand, and there’s a carry strap so the stroller can go from open to folded-and-strapped-on-your-back in a jiffy. There’s only minimal storage, though, and no cup holder. If we had to choose one word to describe the eye-catching Quinny Yezz (available in a number of designer colors), it would be luxury – not because it’s luxurious, but because buying one should be considered a luxury rather than a necessity. It costs a whopping $280, which is an awful lot of money for a primary stroller which doesn’t have many add-ons. If you can afford it as a travel or city stroller, though, you’ll be thrilled with it. Combine most of the features you’d like in an umbrella stroller with a more affordable price than the UPPAbaby ($180, sometimes found on sale for less), and you have this Chicco model whose looks are almost as impressive as its quality. The only real drawback is that the Liteway isn’t quite as “lite” as the other top 5 best umbrella strollers on our list, although it folds up to a quite-convenient size. You won’t find the Liteway as easy to maneuver as the Quinny Yezz, but it’s about as easy to push and steer on pavement as any other good umbrella model; the only area where we were disappointed was in the performance of the brakes, which don’t hold quite as well as they should. What we did love was the construction of the stroller; the frame is strong and tight, the wheels are large and tough, and there are rear shocks to cushion the ride. The large canopy provides ample shade for baby, has a peek-a-boo window, and can also be zipped off if you’d like. Speaking of baby, the ride in the Chicco is quite comfortable. There’s lots of soft padding, there are five recline positions (including nearly-flat for newborns or small infants), and the footrests have nine different adjustable positions. The fabric is rather stiff, but it’s hand-washable. There’s a decent-sized storage bin underneath the seat which can be taken out to be used as a carry bag, a cupholder and nicely-padded handle. The Liteway isn’t as small, as maneuverable, or as lightweight as some other umbrella strollers you’ll find on our list. But it ranks well in all of those categories, while being very well-built and comfortable, and coming in at a friendly price. Isn’t there anything for, say, $100 or so? As a matter of fact, there is. 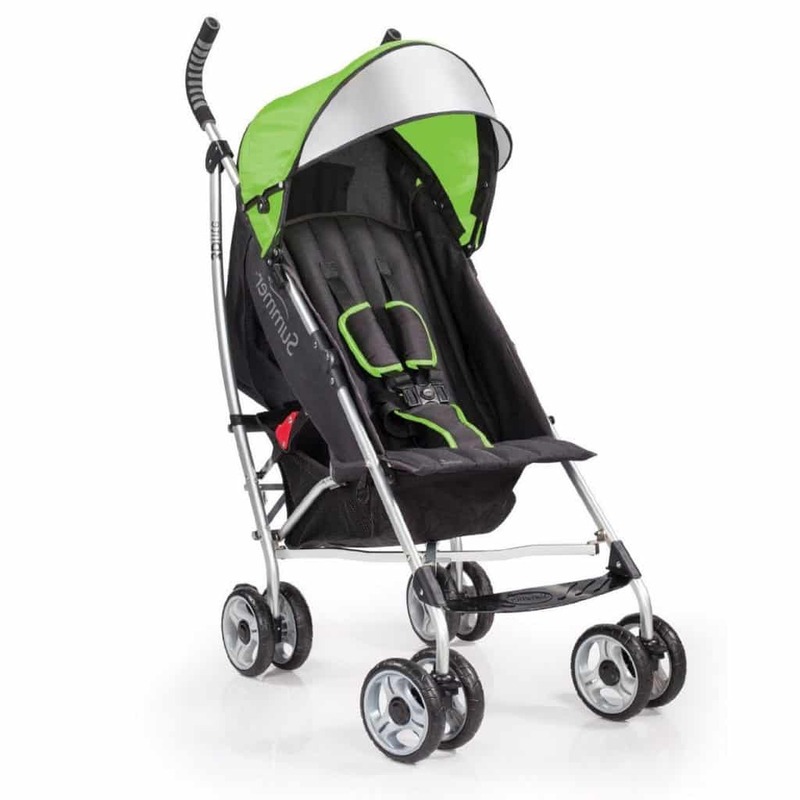 The 3D Lite looks like an umbrella stroller which should cost a lot more. It has a durable aluminum frame and large padded seat which can accommodate more weight (50 pounds) than most of the competition. It rides well, with large wheels (anti-shock wheels on the front) and handles the bounces of traveling on dirt and cobblestones pretty well, although the overall maneuverability isn’t the best we’ve seen. The seat reclines to four different positions for baby’s comfort, and there’s a decent-sized removable canopy (no peek-a-boo window) with a sun visor that flips out; the sun protection isn’t great, but it’s adequate. Folding the Summer stroller is pretty easy, although you do have to use your foot to hit the release pedal in addition to using one hand, and there’s a carry strap like the one on the Quinny Yezz. This umbrella stroller has a large storage basket under the seat, plus a small pocket on the seat back for keys and a cup holder. It’s available in six colors. We may sound like we’re hedging on the pros and cons of this stroller, but that’s not the case. Our point is that the 3D Lite Convenience isn’t ideal in any one area, but is good in all of them. For $105, that’s what you’re really hoping for in an umbrella stroller. Maclaren claims credit for inventing the idea of the umbrella stroller in 1965, and has made good ones for quite a long time. The Mark II is particularly noteworthy because it is the lightest model we’ve seen at just over seven pounds. This stroller is well-made, but definitely designed for larger infants or small toddlers since the sli﻿ng-style seat doesn’t recline and the SPF50 sun canopy (which also has a rain cover) is located so high on the buggy that it won’t do much good for tiny ones. The maneuverability is good and thanks to all-wheel suspension, the Mark II will perform well on very bumpy pavement, dirt or grass. The seat isn’t uncomfortable but there’s not a lot of padding, so once again it’s a better choice for bigger children. The fabric is removable and machine-washable. Storage on this umbrella stroller is in a medium-sized mesh area behind the seat. There are two design issues to be aware of, neither of them major. When the stroller is folded up, the wheels will smudge the fabric; it’s best to have something to put between them. And the safety harness is touchier to buckle than on any other umbrella stroller we’ve reviewed. These aren’t deal-killers, but we mention them so you are aware of the glitches up front. At around $200, the price is rather high for a stroller without the adjustability features found on most of the others we’ve reviewed. But if weight is your primary consideration in choosing the best umbrella stroller, you won’t do any better than the Maclaren Mark II. What is an Umbrella stroller? It is a lightweight, economic, easy to fold stroller for everyday use. The name comes not because of its canopy (as most types of strollers have them) but for its special design umbrella shaped handle. Why do i need to choose umbrella stroller over others? Umbrella strollers are predominantly used for its light weight and manoeuvrability. It is easy to fold and costs much less than the standard built for purpose strollers. It can also be used for jogging, but would still recommend to use jogging strollers as sometime the brakes may get engaged accidentely. What is the typical age range for using the umbrella stroller? Well, the age range varies with each model. While some allow you to use from newborn to upto 6/7 years, others recommend using it from 3 months or even 6 months or until the child can hold its head firm on its shoulders. So please do not forget to read the instructions and match it with your requirement. Can i put my new born in umbrella strollers? Yes there are some models which recline completely flat. They are definetely suitable for infants. Please read the instructions before buying them. Are there different reclining positions available in umbrella stroller? Yes most of them have 3 to 4 recline positions to keep your baby in a comfortable position. Some of them completely recline to a flat position to keep your infant safe while sleeping. Can i adjust the footrest to suit my child? Yes certainly you can. Most of the models does 5 to 9 adjustable positions so that you can keep your child happy while it is sitting in the stroller. Is the canopy big enough to provide shade for my child? Yes of course, it is meant to provide shade for the passenger. Some of the models have wide canopies and some cheaper range comes with a standard one which aren't big enough. Please check the size of the canopy before buying. Can the front wheels be locked for safety? Yes most models allow you to lock the front wheels. As always we would recommend you to read the safety instructions before buying. Are umbrella strollers easy to fold? Yes they are and hence it is gaining popularity among many women who would like to go shopping with their little one and still be able to manage folding/unfolding the stroller with ease. Can i fold the umbrella stroller with one hand? Yes some models are designed to be folded with one press of a button, but not all. So if you are particular about its ease to fold, please have a look at the instruction manual before buying. Is there enough storage space in the umbrella strollers? Yes certainly there is. The space beneath the seat has loads of space for storing baby stuff and also a small bag of shopping. How much weight can an umbrella stroller take? Well that depends on various factors. One, the weight of the child and its stuff, and second, the weight of the shopping bag. You would be probably risking it by adding too much weight underneath as the stroller may not move in the direction you want to and end up in an accident. So please be sensible while loading it, in order to keep the baby safe. Does it have bottle or cup holders? Yes there is but probably only for the passenger. Can i use it on all kinds of terrains? Not really. It fails to move efficiently when you are on grass or gravel. Can i take it on a plane? Yes most conveniently. It is easy to fold and can be checked in at the counter or at the gate. Do umbrella strollers come in more choice of colours? Yes they do. But most of them are unisex colours. If you are particular about blue/pink they are also available in all models. How to clean an umbrella stroller? Most of them can be cleaned with a damp cloth or wipes and the padding cloth of the seat can be hand/machine washed based on the instructions given in the manual. What is the typical age of a umbrella stroller? Though they are light weight, they are meant to last long. They are highly durable and you will see it through for several years. How to buy a cheap umbrella stroller? Well if it is for you child we wouldn't recommend any cheap product as it can compromise with the safety of your child. But there are certainly low range strollers which are of very good quality within your budget. Kindly read through our top reviews which will help you decide on the right umbrella stroller for your child. Where can i buy a umbrella stroller? You could buy them in store or through trusted online retailers like Amazon. Don't forget to read our in depth review page before making the important decision.